Sometimes when it comes to clothes I can be a hoarder... nothing that I need an intervention for where all my friends come over and pry flannel shirts from my kung-fu grip. But I can hold onto things for random reasons for much too long. I once made a rule, that I always break, if I haven't worn it in 2-3 years then I should say bye bye unless there was something special & sentimental, or a nice pattern. This polka dot skirt I haven't worn for well over 7 years & regardless of the fact that the zipper was broken- I just couldn't let it go. As you can see my sentimental side always wins. Well, I recently did another spring cleaning (yes I'm aware it's August) to clear up some space and thought it would be fun to refashion a few things. This skirt was my guinea pig. I used my favorite pencil skirt as a pattern. 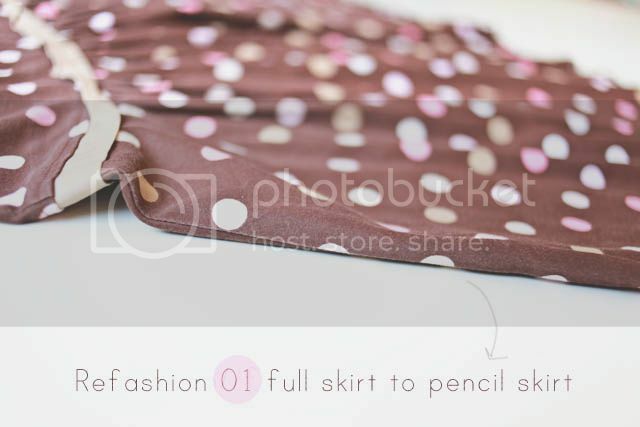 Pinned the pencil skirt to the polka dot skirt. 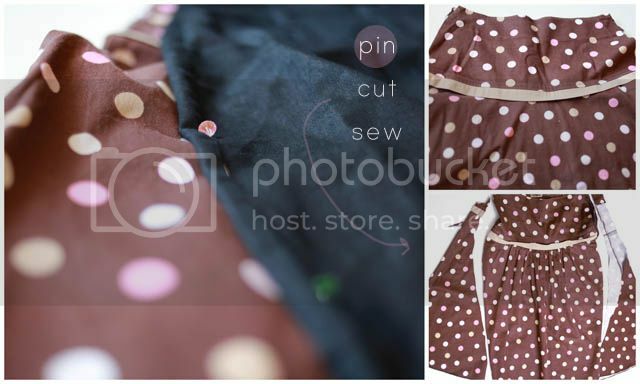 Made sure that since the polka dot skirt has many pleats on the front that the pleats were folded. Then I cut both sides of the skirt, leaving a seam allowance. Next, I pinned one side together (right sides facing each other) and sewed that side seam. Then I sewed the other side seam leaving room at the top for my zipper. Then I tried on the skirt. One of the sides was too bulky so while I was wearing it I pinned where the bulkiness started and stopped (to mark it) then sewed so that the skirt fit more snug. I added the zipper, which is a Christmas miracle that it actually was functional once I finished. The pleats in the front give it enough room so that I didn't need a slit or anything and it not as restricting when I walk compared to my other skirts so I love that aspect. 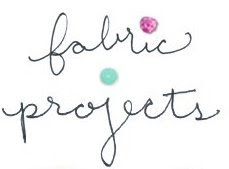 Share any tips or ideas of your refashioned pieces...! I'd love to hear. Before the refashion the skirt fit really low on my hips, now it's sits higher on my waist which was a happy accident. Yes, I had to take apart the seam a couple times but it all came together in the end. We will just have to see how it stays together when I wear it. Would've love to see a 'before' shot of the skirt. Cool skirt and cool hair do!! Wonder what you do to get the soft colors on your photo's?? Just gorgeous! I love the color of the skirt! It turned out great! Love it! Great job re-purposing and with the tailoring and fit. Looks terrific on you. I can see why you wouldn't want to let go of that fabric. very clever Liz, love it! I totally love this. If I could sew...I would so do this. But alas, I am a failure at sewing. Waaaah! Beautiful! I've been spending the last fw weeks evaluating what I actually wear in my closet. I now have a bag filled with things to donate, and another of things I may want to refashion...thanks for proving it can be done! Looking forward to the adventure! If I can do it... you can do it!! 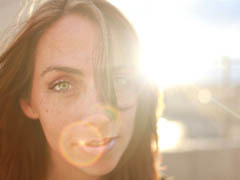 The backlighting while Collin took them gave them a softer look. Pencil skirts fit my body so much better! I need to try this! Nice job! I like the high waist. ADORABLE!!! Love it... wish I could sew! Tres Chic! Oh so Audrey Hepburn. All you need are a cool pair of sunglasses. I would love to learn how to sew so I could do projects like this. This skirt turned out so cute! Wondering if your glasses are for fun and where you got them.....way too cute! so cute - and LOVE the top!!! Where did you get that? wow, that is soooo super cute!! I love the skirt. So beautiful! You look really nice with glasses, btw. Very pretty! Yours is beautiful... I love the color, it seems perfect for the fall. 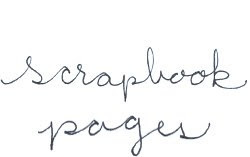 Love your blog Liz! Such a cute skirt. I love the pleating and where the horizontal line of fabric would accentuate my post-baby belly, it really looks amazing on you. This is so Fab! And, You look Beautiful! Love it! You are inspiring! I'm counting down 'til your next Dear Lizzy Line hits stores...I can't wait! (tee-hee) PLEASE keep us posted when you can! Thank You! oh my gosh - I now know exactly what to do with all the A-line skirts in my closet that I think make me look older than I am. Love the photos. Ur a great photographer! Superb idea...Its really looking cool.I have many old fashioned skirt.And now i know what to do with them.Thanks for this wonderfull idea. You look so good hot mama! Great Job!